Oracle cards, also known as wisdom cards and tarot cards, are cards used for divination, fortune-telling, astrology and spiritual guidance. Oracle cards are useful for anyone looking for answers and meaning. They differ from tarot cards in that they do not necessarily follow the traditional suits of tarot cards. Wisdom cards provide powerful messages to encourage positive thinking. Many people ask how oracle cards work and there are many answers to that question. Some believe that tarot, oracle and wisdom cards give the user the means that understand their own thoughts and decisions. Others believe that tarot cards give the user the means to access the guiding spirit of the universe. Others feel that they operate by the Law of Attraction, seeing the answers of the cards as the magnetic pull of the universe. 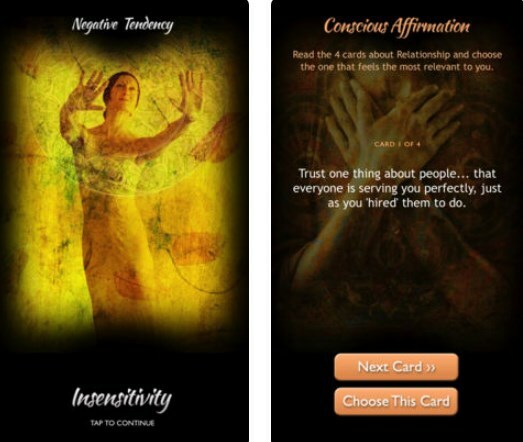 Get ready to turn your phone into an on-the-go spiritual adviser with one of the best oracle card apps - Inner Oracle Cards. What is Inner Oracle Cards all about? For all Android and iOS users that want to find their true Self and experience a whole new level of divination on the go, we have one of the greatest oracle card reading apps ever made. Inner Oracle Cards is brought to all of us by Dr. Rick Moss, who created it after teaching meditation for 20 years and realizing that meditation alone does not change subconscious patterns, and by itself is not enough for transformation. We loved the app’s amazing artwork and its accurate and quick oracle card readings that really are able to help us free our minds. For anyone looking for answers and meaning, for users that seek spiritual guidance and want to free their minds and live their lives fully, Inner Oracle Cards is here to help you out. This powerful tool provides with 4 oracle card decks (Issue, Negative Tendency, Conscious Affirmation, and Unconscious Affirmation) that lead you to detailed steps to integrate the meaning into your life. They have the ability to help you overcome conscious and unconscious blocks and free the greatness that lives inside you. All you have to do is pick the first deck, follow the steps and read your cards. In the end you will begin your healing process and start discovering your new and true Self. These oracle cards will connect you with your intuition and inner wisdom! Moreover, Inner Oracle Cards allows users to save their recent oracle card readings for review and send card reading to friends and family. So, if you’re ready to liberate yourself, download this amazing app right away – it’s available on both Google Play and the App Store.